Alvis Hermanis, Brodsky/Baryshnikov, 2016. Performance view, Baryshnikov Arts Center, New York, March 8, 2016. Mikhail Baryshnikov. Photo: Stephanie Berger. IS DEATH A CRUELER FATE for those who have lived a creative life? Is it a greater tragedy that one day a body that has channeled dance or theater or poetry will betray not just life, but art too? These questions surfaced in two recent productions, each of which consider the condition of the male artist in his golden years: Alvis Hermanis’s Brodsky/Baryshnikov starring Mikhail Baryshnikov, and Robert Wilson’s performance of Samuel Beckett’s Krapp’s Last Tape. At the center of both plays are the words of long-dead authors, ego ideals for the artists on stage. In the face of their own mortality, Baryshnikov and Wilson look to Brodsky and Beckett respectively for a form that can both contain and express gratitude, anxiety, rage, and grief. But where one production succeeds in creating a work of theater that bangs against the inevitable with great life force, the other falls to a different kind of death: that of the lively imagination. will trouble you with bitterness. and I’ll shudder in my grave. Brodsky chased The Grand Themes—life, nature, love, death—capturing the muses of his voracious mind with the aim and focus of a big-game hunter. Hermanis claims that when he first read Brodsky’s poems as a young man, they shook him to the core. Baryshnikov and the poet were famously close friends, both Russian exiles landing in 1970s New York to live as Western artists live. Although neither man can restore a body to Brodsky, together they can, and do, give him the power to move. We hear his words spoken from the stage by Baryshnikov; we hear them in taped recordings of the poet made during his lifetime. In the space of this performance, these two artists make Brodsky’s words physical—connecting poem to sound and sensation and action and reaction. Reverent, quixotic, Brodsky/Baryshnikov is a genteel meditation on what and who a writer’s life leaves behind, and what they can forge in his memory. The action takes place in and around an empty, dilapidating solarium possessed of a fading elegance: Moss laces itself along the room’s ribs, and fraying wires spit sparks from an overstuffed fusebox hanging above its doors. (“Ruins are a celebration of oxygen and time,” wrote Brodsky). When Baryshnikov enters, the lights flicker, an electrical surge that might otherwise signal the beginning of a séance. (Someone is coming through.) From a briefcase, the dancer unpacks books, an alarm clock, and a bottle of Jameson whiskey, Brodsky’s favorite. He picks up one of the volumes, and begins to read, and from there the performance unfolds. 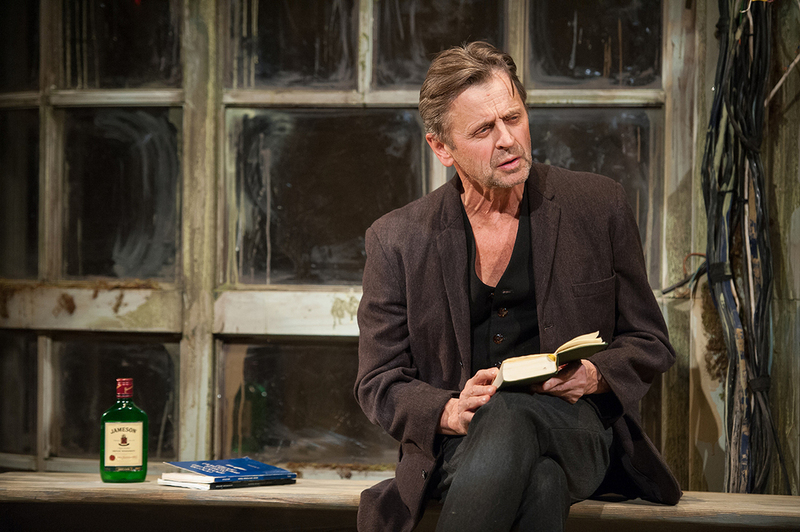 Baryshnikov recites, listens and moves to Brodsky’s words, which are all spoken in Russian. A reel-to-reel tape recorder sits on a bench, turning itself on and off, playing back the poet’s voice. (English supertitles scroll up the top of the solarium.) The dancer does not dance, per se; his movements are more an act of translation, of language and its images running through the body. In moments, his gestures are sweet, even a bit hokey, as though illustrating the text. “Watch the centuries pass, disappear around the corner,” we hear as Baryshnikov takes off his shirt, jacket, and shoes, pulls his trousers up over his knees, and smears his bare chest with what looks like cold cream. “See how moss grows in the groin, / and dust settles on the shoulders—it’s the tan of time.” Others are more poetic: He breathes on the solarium’s windows to fog them, his breath made visible only to disappear as quickly. Still others are more inscrutable. Toward the end of the play—at its de facto climax—Baryshnikov opens the double doors of the solarium and sits on a chair in the center of the threshold. “Let’s look at tragedy’s face,” we hear, as he convulses, goes rigid, his body pivoting in place, stiff as an antenna. “Hello tragedy, your clothes are out of fashion.” He begins to smacks himself in the stomach, to mime pulling out his guts, becoming some kind of writhing, awful creature. draw a circle on paper. That will be me: nothing inside. Take a look, then erase the line. 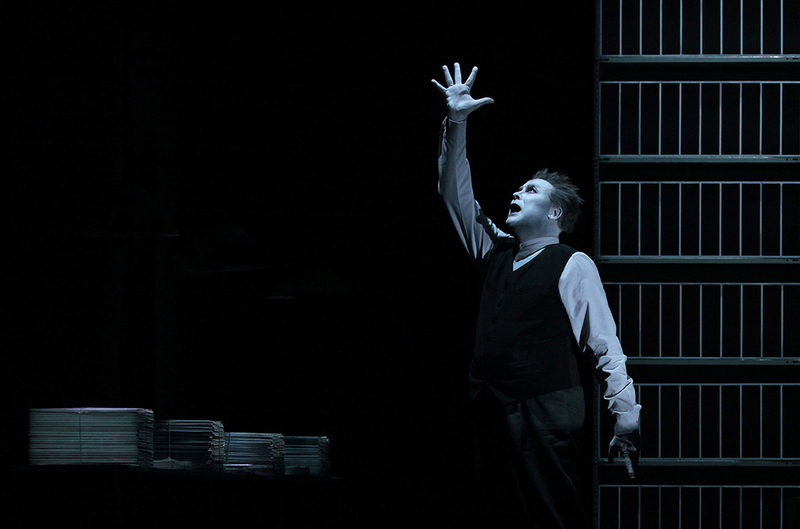 When all is said and done by Brodsky and Baryshnikov, the performer packs up. A sip of whiskey, a look around, a last poem, and then he exits, leaving only what was there, having disturbed the air for a little while before going, before being gone. Samuel Beckett, Krapp’s Last Tape, 1958. Directed by Robert Wilson. Performance view, Louis-Jouvet Theatre Paris, France, December 7, 2011. Robert Wilson. Photo: Lucie Jansch. KRAPP ISN’T A POET. He’s a writer. At least, he wrote. “Seventeen copies sold,” he recounts into the microphone of his reel-to-reel recorder. It’s his sixty-ninth birthday, and he marks the occasion as he has for decades: recording the details of his previous year onto tape. His last book may have been a failure, but words are still what jolt him from the doldrums that seem to have descended long ago. He delights—revels is the verb he uses—in the word spool; he stirs from his desk to retrieve a dictionary when he can’t remember the meanings of viduity. He weeps rereading Fontane’s Effie Briest; and he listens, enrapt, when he plays back the words he recorded for his thirty-ninth year. Time and drink and solitude have withered old Krapp, now hollow as an eardrum; the words he hears echo in the space where memory would otherwise be. His younger self is fuller of himself: his voice, pompous, his mind clear as a newly frozen lake beneath which life is beginning to go dormant. Perhaps the elder Krapp clings to words in part because words have almost all but left him. “Nothing to say, not a squeak,” he dictates into the microphone, not long before he speaks his last. “Language is the barrier of the imagination,” theater artist Robert Wilson famously declared, which is one reason it’s so odd that he would choose to direct and perform Samuel Beckett’s hallowed 1958 one-act Krapp’s Last Tape. Words have never been Wilson’s muse; if anything, they’ve been his bugaboo, a medium he deranges inside of his spectaculars. So if not for love of the playwright’s words, Wilson seems to find something else of interest in Beckett’s tale: the opportunity to watch this grand elder statesman of the avant-garde take on the story of a man nearing the end of his tape, so to speak. I am totally opposed to your idea of bringing Endgame up to date in an Alterscheim or other fashionable hell. This play can only function if performed strictly as written and in accordance with its stage directions, nothing added and nothing removed. The director’s job is to ensure this, not invent improvements. Alas, for poor Beckett, Wilson may well be the reigning czar of invented improvements. He belongs to that irritating ilk of director who, having established their aesthetic—their brand, more to the point—seem to clang their theatrical style over a work of literature like cold armor over a warm body. (William Kentridge and Ivo van Hove are two others in line for this crown.) Rather than engage with the text in a collaborative spirit—in which the play and the director remain porous, open to each other—these artists inoculate themselves against a text, lest it infect or defect their vision. It appears (to this writer, at least) a self-serving auteurism, a paralyzing holdover from the era when it was discovered that killing daddy was a lot more work than just borrowing his stuff. Of course, Beckett’s dead, and there’s no reason to believe that an author should always have the last word on her or his plays, but Wilson’s Krapp evacuates the playwright where it would be far more interesting—at this point in the director’s esteemed career—to watch Wilson take Beckett in, metabolize him, and create a performance that belongs to neither, that bridges the wide space between the two. For Beckett, Krapp may be an old fool—wearish is the word the playwright uses—but he’s no clown. Unfortunately, Wilson can’t do without his kabuki-ish makeup and cartoonish gestures, can’t appear unpainted, unhidden, on view for an audience to get a good long look at. He designs Krapp’s den so that it looks like a pristine, steely bunker, bound ledgers stacked neatly on both sides, in a grayscale palette interrupted only by Krapp’s ruby red socks. (Beckett had him in a “surprising pair of dirty white boots.”) The space is stunning, as ever. Wilson’s eye is never not brilliant; his sets and lighting are always possessed of the foreboding perfection of a fairy-tale land. The director chooses to begin the play with the invented improvement of a deafening thunderstorm, as though a B-horror movie and Krapp—standing there stiff-haired and dumbstruck, like a deer in the footlights—is some kind of monster. Wilson’s movements channel Buster Keaton (star of Beckett’s only screenplay, Film), lumbering, stumbling, and occasionally leaping across the stage; his face, however, is more Gloria Swanson (Norma Desmond in Sunset Boulevard), eyebrows high, expressions extreme in imitation of emotion—a performance style that utterly flattens the nuanced emotional registers of Krapp’s tragicomic condition. “Writing words, words more words,” Desmond famously laments. (Like Wilson, she didn’t much care for them either.) It’s his disregard for Krapp’s words that’s the most disappointing and frustrating of all his choices. Wilson’s refusal to entertain the usefulness of Beckett’s strain of naturalism ripens the play into a pulpy version of itself. Krapp’s speech echoes that of a cartoon. “Spooool!” he rhapsodizes in what he describes as the “happiest moment of the past half million.” But out of Wilson’s mouth, this beloved word sounds like a slide whistle, careening up up up and away from the play.